The current gold standard in tattoo removal is a Q-switched laser. Q-switched lasers emit high energy pulses of light to shatter the tattoo into micro-particles which are then removed by the body’s lymphatic system. With a strong affinity for tattoo ink, Q-switched lasers are best at fading or removing tattoos whilst minimising side effects. On average, 5-15 treatments are required for tattoo removal. It is also possible to simply fade the tattoo, to more easily allow it to be tattooed over, or to remove part of a tattoo. Treatments are typically performed 6 weeks apart. Who is suitable for laser tattoo removal? Tattoo laser removal is suitable for every skin type. Cosmetic tattoos, including tattooed eyebrows, eyeliner and lips, are suitable for laser tattoo removal. 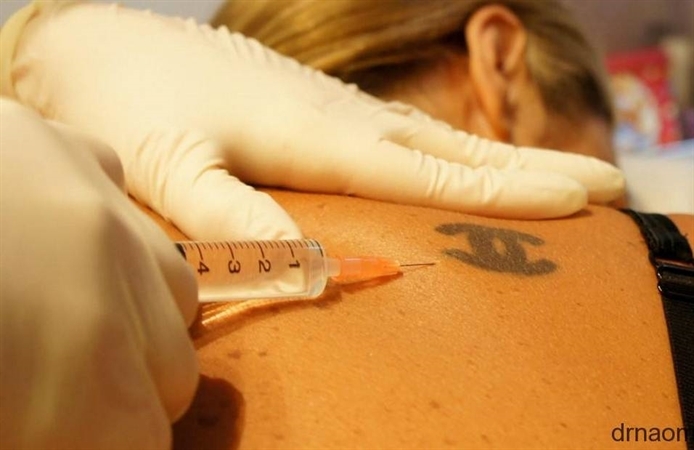 However, occasionally cosmetic tattoos may change colour, turning black or dark green during the treatment period. Test patches are performed on cosmetic tattoos to assess this risk. Traumatic tattoos, such as dirt embedded in the skin, are also suitable for laser tattoo removal. All tattoo colours can be treated; however, skin coloured, as well as white and yellow tattoos, are most difficult to completely remove. Dark blue, black and red inks are most readily removed, while sky blue and green ink can be more resistant and require further treatment. At your consultation, assessment of the treatment required will involve the colour of the ink, location of the tattoo on the body, the amount of tattoo ink, skin type and whether the tattoo has been layered over with another tattoo. Depending on complicating factors, complete removal of the tattoo may not be possible, although in many cases this is achievable. As there will likely be pain involved, you will be provided with options for pain relief including EMLA or other topical anaesthetic creams, nitrous oxide (“happy gas”), Penthrox (an inhaled analgesic) or a local anaesthetic injection. However, as most procedures take less than 2 minutes, depending on the size of the tattoo, many patients tolerate the treatment well without pain relief. Please note that additional cost may be involved if you opt for pain relief. After your tattoo laser removal treatment, the tattoo may appear slightly red and raised. There may be a frosted appearance, as well as pinpoint bleeding, blisters and scabbing. Scarring and infection are unlikely side effects of all laser treatments. Compliance with aftercare will minimise the risk of these side effects. There is also a small chance of skin pigmentation change and the skin will appear slightly lighter in the treated area. The risk of this side effect increases with the number of laser treatments. In most cases, pigmentation change is a temporary side effect, although occasionally the lightened area may be permanent. What is the downtime after tattoo removal? It is best to limit physical activity for 24 hours after laser tattoo removal. Avoid swimming and sun exposure. It is fine to shower, however, use mild, non-irritating soap only and avoid hot water. When do I start to see results after tattoo removal? Generally, 1-3 treatments are needed before the tattoo is visibly lightened. Every patient is an individual and will see results at varying times. Prices start from $120 per treatment. Price is relative to the size of the tattoo.